I am currently indulging in a bout of nostalgia with an old comic book from my childhood, a comic called Starlord. This post is about issue number 21, which came out on 7 October 1978. This is the end of the road for Starlord, but just the beginning for me rereading 2000 AD, you have been warned. You can read this vintage comic book too, because scans of the entire run of the comic are available at Starlordcomic.com. As I said, this issue is the last Starlord ever published, and it is a very sad occasion for me. The somber colors and words of the cover capture the mood beautifully. 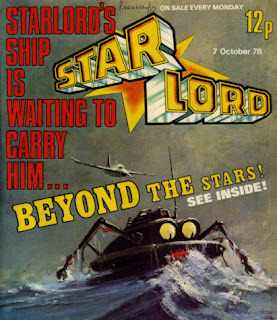 The cover of this final issue shows a shuttle bobbing in the waves, signifying a battle lost against the power of forces beyond our control, like in the Tale of Ancient Mariner or The Old Man and the Sea. 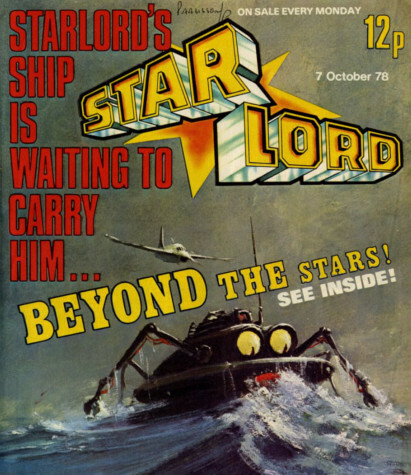 Starlord enriched the lives of thousands of readers in 1978 a summer rich in fantastic artwork and imaginative storylines, and Starlord is fondly remembered today. It had to come to an end, because of the price of publishing it, but it earned the somber mood of its send off. Anyway, let’s try and enjoy the very last issue. 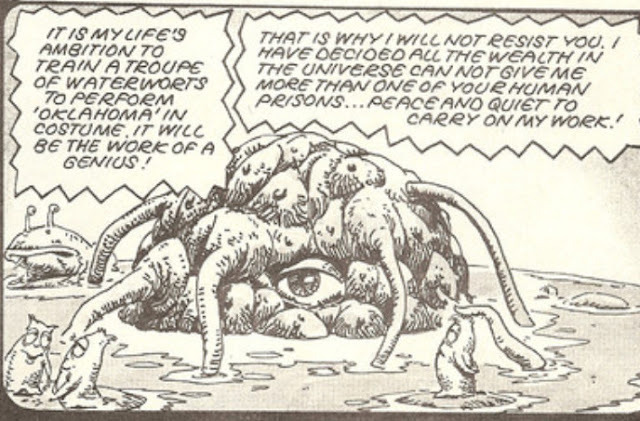 As always, the comic starts with Mind Wars. I could hardly bring myself to reread it, because I know they have to wind up this rambling epic in just this one last episode. There is an innocence to this story, something indefinable that modern sci-fi has lost. It is bound to be a slight disappointment, like the last episode of Seinfeld, or any other beloved story, but not to read it would be even worse. At least back then I could kid myself that the story might continue in another comic, but now, forty years later, I am older and wiser. I know this is definitively the last episode. It’s doubly sad to have to read it in the knowledge that it will never return. Within the space of this one episode, Ardeni escapes the trap set for her by the alien species that gave her her powers, brings a war fleet to their home world, and disables all the weapons on both sides of the conflict. It feels rushed, but ultimately, sort of satisfying. The next strip in the comic is Ro-Busters, but this strip doesn’t have to be wrapped up as quickly as Mind wars. That’s because it is making the transition to 2000 AD, which will be called 2000 AD and Starlord. You can see in the image above that the strip, like the whole comic, is influenced by Star Wars, but that just makes it even better to me. The robots save their boss by extracting and disarming a bomb that had been hidden in his cyborg chest by his brother, but are not given any thanks or respect. In the last panel they say that should join the opposition, and the box at the end of the strip says that’s exactly what they do. I remember reading that, and feeling very excited at the prospect. 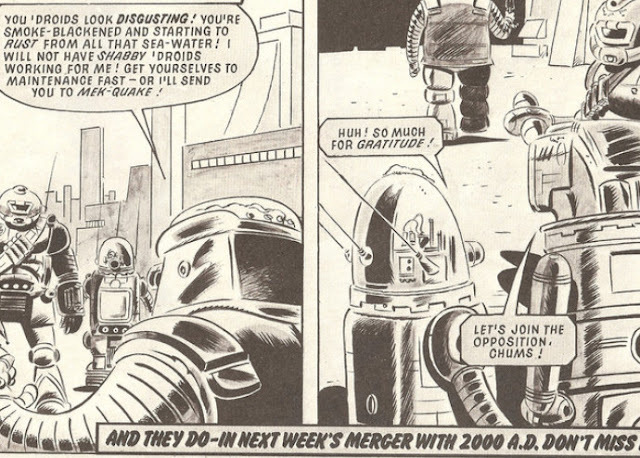 It doesn’t happen immediately on transferring to 2000 AD, but Ro-Jaws and Hammerstein do end up joining the robot rebellion, and it will be one of the best stories ever told in comics, but that’s all for the future. 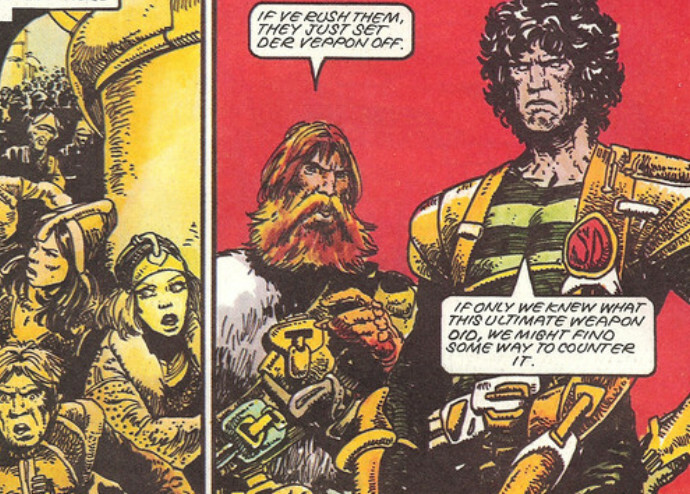 Strontium Dog will also he making the transition to the new comic, so this story too is unhurried. 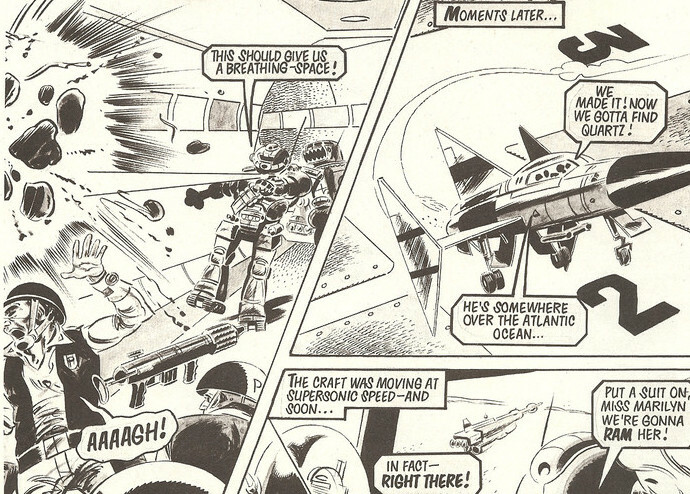 It is, as usual, beautifully drawn and colored by Carlos Ezquerra, though only the first two pages are in color. It’s a touching story about a super-intelligent villain. The creature is little more than a brain who sits in a tank. He actually wants to go to prison to get some peace and quiet. It turns out that even Johnny Alpha wouldn’t have been able to take him in if he had wanted to resist. Then Starlord himself tells us in groovy 70s graphics that the party is over. Apparently the comic was a way of training Earthlings to resist an alien invasion, and now the aliens are too frightened to invade. They have abandoned their plans and Earth is safe. That’s good news, I guess. 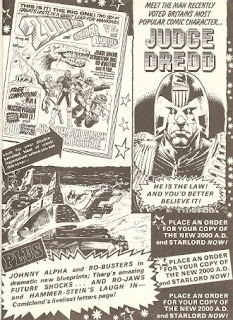 The advert for the future of the comic looks bright and exciting, but it is till the end of an era. 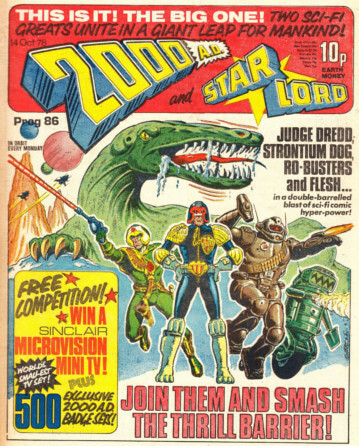 The era started a year after the launch of 2000 AD in 1977, when publishers IPC decided to cash in on its success with a new stablemate – Starlord! Starlord would have longer stories, better paper, and more color. It would be like 2000 AD, but better. 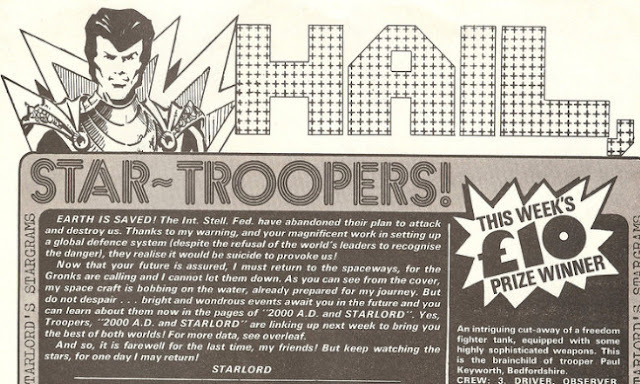 As The Thrillcast: Starlord blazed into the firmament with its own eponymous editor as well as all-new stories such as Strontium Dog, Ro-Busters, and Mind Wars! But it was not to be, and after just 22 issues it was decided to merge the title into 2000 AD - a decision that arguably saved the older title as well as giving it two of its most popular ever strips. Without Starlord, 2000 AD would have died, but for 2000 AD to survive, Starlord had to pay the ultimate price. Of course, back in late 1978, I went from Starlord to 2000 AD, and I am going to do exactly the same now. I will be starting a 2000 AD Prog Slog at issue 86, called Prog 86 in 2000 AD jargon. 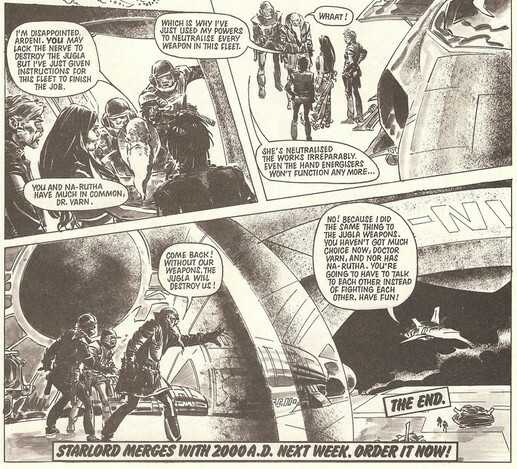 Starlord is gone, but sci-fi thrills will continue, in 2000 AD.